Cape Town - Although SA's banking sector has the ability to withstand a tough environment, there are significant risks on the horizon, cautioned a banking analyst. South African banks have found themselves in the cross-hairs for quite some time now given the persisting low-growth environment and stream of political noise. Neelash Hansjee, a banking analyst at Old Mutual Equities, said the banking sector remains fairly protected by their strong balance sheets and the diversification of their earnings. However, there are significant risks such as a local currency downgrade by credit rating agencies and a crisis of confidence with the possibility of a low growth environment for longer. “The direct impact of a local currency downgrade is an increase in the funding costs for banks which would introduce some margin pressure. This may get passed on to the consumer through higher borrowing costs." The indirect impact, Hansjee said, is the greater levels of uncertainty it creates for the economy, which is a crisis of confidence. “The crisis of confidence has been rising through political and economic uncertainty. Leaders and companies are uncertain on how to act as it becomes difficult to have visibility on the way forward." He said this has filtered through into confidence levels, investment and growth. "Hence a growing risk is a lower growth environment for longer." These risks have been driven by compounding political uncertainty and an increasingly challenging economic environment. A more cautious stance is now being taken in valuing South African banking stocks. “We are taking a more conservative view, given the current operating environment for banks. Lower growth and lower interest rates are likely to slow revenue as margins get snipped and credit quality may deteriorate from here, placing pressure on earnings," Hansjee said. However, he said capital positions have strengthened over the year and dividends can be sustained in a low growth environment which provide an attraction. "A higher risk premium is therefore being built in to our valuations, to take account for the higher level of uncertainty." Based on these valuations, Hansjee said while there may still be opportunities in bank stocks over the remaining portion of the year, the same level of outperformance that has been demonstrated in recent months may not be seen. Hansjee said the outlook for the banking sector as a whole remains challenging but offer some resilience against a tough outlook relative to other companies. 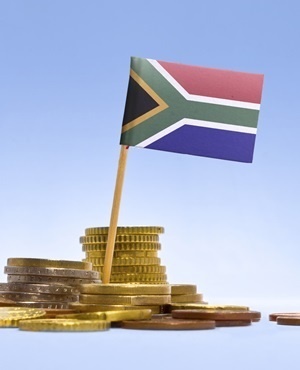 Last week, ratings agency Moody’s noted that SA banks were operating in an “unpredictable domestic political context”, with unfavourable commodity prices, weak consumer demand and still-rising unemployment. In its 22-page report entitled "Banking System Outlook - South Africa", Moody’s maintained its negative outlook for the South African banking system. However, the ratings agency also highlighted that the South African banking sector exhibited some strengths.